To commemorate the 400th anniversary of the deaths of William Shakespeare and Miguel de Cervantes, The British Council, Acción Cultural Española, Hay festival, And Other Stories and Galaxia Gutenberg have selected twelve contemporary international authors to each write an original and previously unpublished story as their tribute to these giants of world literature. 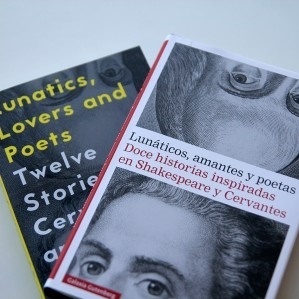 In order to celebrate the international influence of both writers and offer us new and intriguing perspectives on them, six English-speaking authors have taken inspiration from Cervantes and his work, while six Spanish-language authors have written stories inspired by Shakespeare. Daniel Hahn y Joan Tarrida will offer us their vision as curator and editor of this unique anthology sealing together two of the most spoken languages in the world.